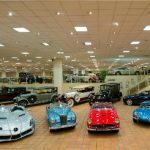 We visited Prince Rainier III’s car collection on the Terrasses of Fontvieille – we saw almost 100 cars of all ages and the Lexus from the 2011 Royal Wedding. Also on display were racing cars, which have competed in the Rallye de Monte-Carlo and the Monaco F1 Grand Prix. Next was a visit to l’Orangerie, founded in 2015. The owner, Philip Culazzo showed us how the organic product is made from Monaco grown oranges. We enjoyed a 3 course lunch in a charming local restaurant, l’Aurore sur le Vieux Rocher.